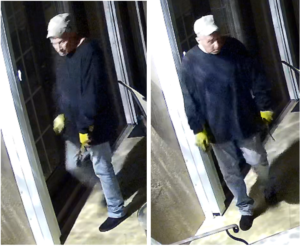 The Palm Beach County Sheriff’s Office is seeking the public’s assistance identifying a suspect WANTED for Attempted Residential Burglary. An unknown male suspect was seen on the victim’s rear patio holding a small pry bar. The suspect was described as a white male, wearing dark clothing, yellow gloves and a beige hat. This incident occurred on January 12, 2019. The residence is located in Western Boynton Beach. ← The Palm Beach County Sheriff’s Office is seeking the public’s assistance identifying burglary suspect in the Lake Osborne area.